Is Your Man Taking The Piss? I was asked this question a couple months ago by a male friend, big up Hartwell, and I was astonished by the question. It took me a while to register what the scenario was. As of recent this was shown to me again so I felt like addressing it with not only my female readers but my male readers also. There is an unfamiliar female sitting in the passenger seat. Not a big deal, as I had to point out to a lot of people she could be anyone including a family member so from here I think it would be crazy to draw conclusions. Don’t give into your hormonal self. Girlllllllll stay calm. See this is when I’d become synical, no matter who she is to my partner she obviously does not deem me important enough to introduce herself. My emphasis is not even on the fact that she hasn’t realised that she needs to inhabit the back seat because as I said I don’t know who she is or why she is here. She may have a wooden leg which she can’t squeeze up in the back of the car. My problem is she’s not told me why she gets to call gunshot on my man’s passenger seat. It’s called manners! I got a range of answers from the females I know. I would get in the back but remain silent for the whole journey so he knows I’m pissed. We would then deal with it when we get home. – this is the wife who will never shame you in public, I love it but it ain’t me. Nah that’s the point that I’d lose it and tell her to get out of the car. I’m sorry but that’s my seat. – this is the no nonsense wife, I will embarrass you before you embarrass me, this isn’t me either only because I believe all the blame should rest on my partner. My take on it? No matter who this female is to him he has given her the impression, or allowed her to believe, that I am not important enough for her to need to introduce herself to me, I have no leverage as his partner not even enough to sit beside him in his car. This female clearly doesn’t rate me and I don’t know her so the only perception of me that she should have should be from my partner. What would I do? The 2 S’s, stand and stare, as long as it takes. I’m not joking in the slightest. I’m going to look her in her face so that she understands that I want something from her this should usher her to open her mouth. Boo your going to talk even if you don’t want to, he may not have told you to respect me but trust me I can let u know. So I’m going to make you feel uncomfortable just like how I feel. Better yet if she looks to him for help, there’s his predicament, who do you try to keep sweet. 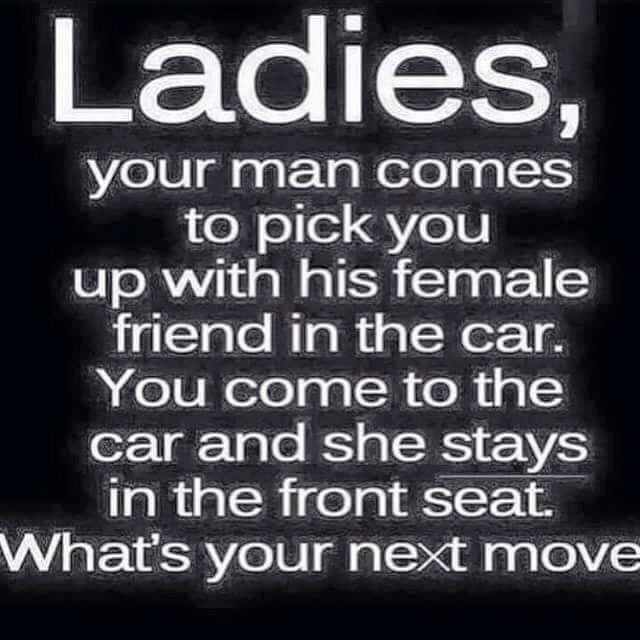 For me it’s not about the seat, if the female is an older woman to me out of respect I wouldn’t expect her to explain herself to me and I would not have let her get in the back just to stroke my ego. Respect. If the female is someone of importance to him, again I am not trying to battle for superiority, if I trust my man I trust my man, but it’s the feeling of disrespect when noone wants to address or introduce themselves. Especially when they are in the vehicle of someone I hold dear to me. If all else fails girls, just turn to your man and say, “I’m not getting in the back babe, there’s not enough space, you’re going to have to tell your friend to ask her man to come pick her up.” Throw in the innocent smile after as though you haven’t a malicious bone in your body. If they’re going to play dumb why can’t we. Pshht.